Shubhra Gupta, The Indian Express 1.5 Out of 5 The sequel to ‘Singham’ is chock-full of the usual car-on-jeep action. Explosions go off at regular intervals. Shoot-outs—one really well-shot-- occur frequently. Saibal Chaterjee, NDTV 2 Out of 5 Singham Returns has a fair sprinkling of angry wisecracks that might draw spontaneous whistles and loud claps from those that love violent fights to the finish. One can only hope that this is indeed the end, and another sequel isn’t lurking in the future. Manjusha RadhaKrishnan, Gulfnews 2.5 Out of 5 The action is there, but is not so violent, and you don’t feel overwhelmed. The language is clean with punchy one-liners from various characters, written by Sajid-Farhad, and makes the film watchable with family. Mohar Basu, Koimoi 2.5 Out of 5 Singham Returns doesn’t match up to Singham and that is the failure of this franchise venture. It is definitely a very watchable film with Ajay putting in his best foot forward in a role that brings out his caliber to the fullest but for those who are expecting a Rohit Shetty fun watch, this film is neither immensely entertaining or superbly enjoyable. The action doesn’t offer anything new and the drama is too superficial for my taste. It is just about average and that too only for its lead man whose swagger rules the show in this one. Rohit Khilnani, Headlines Today 3 Out of 5 The dream team of Rohit Shetty and Ajay Devgn delivers a good entertainer. It's for fans of brand Singham and I'm sure they are all out there in large numbers. Shubha Shetty Saha, Mid Day 3 Out of 5 Rohit Shetty's cleverest moment comes when his hero after having witnessed the most expensive SUVs turn to ashes, has a humble, kind of apologetic tiny personal car, thus subtly highlighting his clean conscience. The rest of the film is not so subtle. Sukanya Verma, Rediff 3 Out of 5 Returns offers quite a bit to whistle about with its steady supply of straightforward action and a hot-headed hero who delivers a punch with a fist and a line. 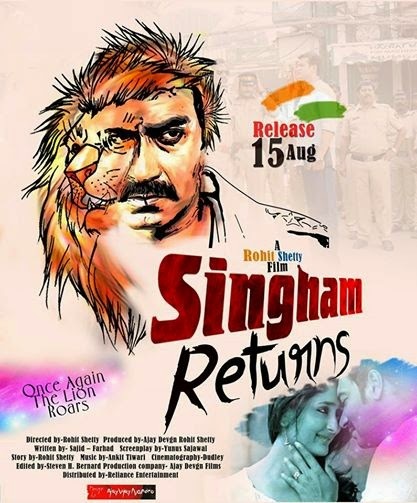 Taran Adarsh, Bollywood Hungama 4 Out of 5 SINGHAM RETURNS is a complete mass entertainer with power-packed drama, hi-intensity dialogue and towering performances as its aces. The brand value attached to it coupled with a long weekend will help the film reap a harvest and rule the box-office in days to come. A sure-shot WINNER!